Where can I get motion reference videos for animators to help me create realistic motions? Do cartoonists and animators use some kind of animation reference materials to help them do it right? I have been working with a new MMDer via email… showing her the very most basics of getting started with MMD… and she went straight into trying to animate a nice walking motion. Being very much a newbie, she was having some trouble with it. You gotta admit, “Walking” is not the best way to start to learn animating motions from scratch! But… she got pretty good at it pretty quickly! She told me she needed animation motion reference materials as an aid since she didn’t really know “how” the motions should look. 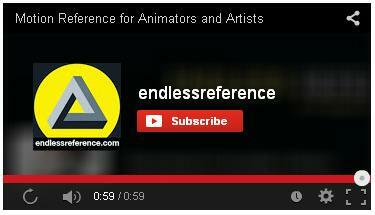 I had no answer for her, so she went out and found this marvelous group of motion reference videos for Animators from Endless Reference on YouTube. Studios producing top-quality animations often shoot a live-action sequence of a scene so as to have that animation reference material available for their artists to study. I have an old laserdisc of Disney’s “Peter Pan” that, as an “Extras” feature, includes a handful of the old B&W live-action sequences they filmed using live actors and the actual voice-talents whose words we hear in the finished film. I am guessing it’d be easier to do the lip-sync as you watch the actual voice-actor speak his lines! Visit their YouTube Channel and click around! They reference one of their publications… $24.95, I think… that is a PDF of all of their motions that you can purchase and keep on your desktop for instant reference… and I guess it contains a few more videos that are not included in their free YouTube collection. Fun stuff… and a real discovery… Enjoy!